Intellidex’s second survey into the tax-free savings account (TFSA) market, conducted in 2016, shows they are gaining strong traction, with R2,6bn invested across 262,493 accounts opened in the first year. There were 27 respondents to a questionnaire sent in April 2016, though some were from different divisions of the same firm (eg, banks’ cash and stockbroking TFSA offerings). We estimate the sample includes more than 95% of the universe by assets and the results are a reliable guide to total market activity. The main goals of the survey are to assess the impact of TFSAs on savings behaviour in South Africa and on institutions in the investment industry and the products they develop. The findings show that TFSAs — savings and investment accounts in which all tax is waived, including capital gains tax and dividends tax — are making an impact in attracting new savers. Respondents believe 21% of the accounts opened are by first-time savers. However, it should be noted that an unknown number of these are held by minors, where parents have effectively donated the balance. 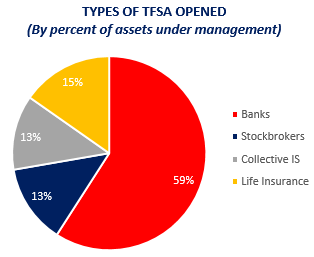 They are also a strong source of new assets for firms with two thirds of the assets in TFSA accounts being newly under management. Of the firms that provided data in response to a question about whether the assets in TFSAs were new to the firm or transfers from existing accounts, 74% of TFSA assets were new to the firm (managers of R2.18bn answered the question with no particular bias to firm type), rather than transfers from other savings products.Similarly, 71,319 account holders (27%) invested the full R30,ooo on opening the account but just 78,045 (30%) had invested the full R30,000 by the end of the tax year. This indicates relatively few users are successfully budgeting to allocate a monthly amount so as to exhaust the allowance by year end. This is despite the fact that 35% of TFSAs are funded by monthly debit order, according to respondents.